The idea of the Amphibian Ark initiative is to get out in front of the population crashes and to collect healthy frogs, whisk them to safety, and establish breeding stocks — with the hope of reintroducing the species to the wild when the coast is clear. In Australia, scientists have modified shipping containers to create frog “clean rooms” in the field. In the United States, they’ve saved the Wyoming toad in captivity, but it has disappeared from the high plains, and reintroduced populations keep encountering the deadly fungus. Biologists are also rushing to respond as the fungus attacks the boreal toad in Colorado and the red-legged frog in California’s Sierra Nevada. And many more frog rescues are underway in Costa Rica and several other countries. 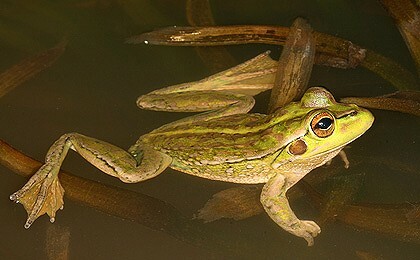 Once chytrid hits a region, the amphibian population can be wiped out within four months.”The rate of spread is about 22 km/year, so we have less than five years before they are all gone,” Lips says, referring to the remaining frog populations in Central America where she has been working as a”forensic ecologist” to predict the spread of chytrid throughout Costa Rica and Panama over the past 10 years. What Jennifer Holland has reported in National Geographic is one of the best summaries of the amphibian crisis I have read. The photos are beautiful, the anecdotes fresh and unforgettable. You need to read it. Click HERE. Society for the Study of Amphibians and Reptiles (SSAR). I know my daughters, when in elementary school, were thrilled when the classroom would adopt a snake or a guinea pig. What great lessons occur when a teacher instructs children how to care for an animal, and when children take turns providing that care. Now a movement is under foot to involve classrooms in the rescue and care of amphibians. A noble idea, but one fraught with danger if the amphibian were to catch a disease from a reused aquarium, and then is released back into the wild, introducing a dangerous new pathogen to a woodland area or pond. Zippel and company overview the situation, and provide practical steps that teachers should take, in the paper you can access by clicking here.